A couple weeks ago, I started working at the tomato farm just behind the neighborhood I live in. I discovered it last summer when we moved here and got to know the owners. They grow the best tomatoes in the area, including heirlooms. They also have peach trees and blackberry bushes for U-Pick. That’s exactly what I did one morning, and that afternoon, a Farmstand Blackberry Peach Cobbler was in the oven. 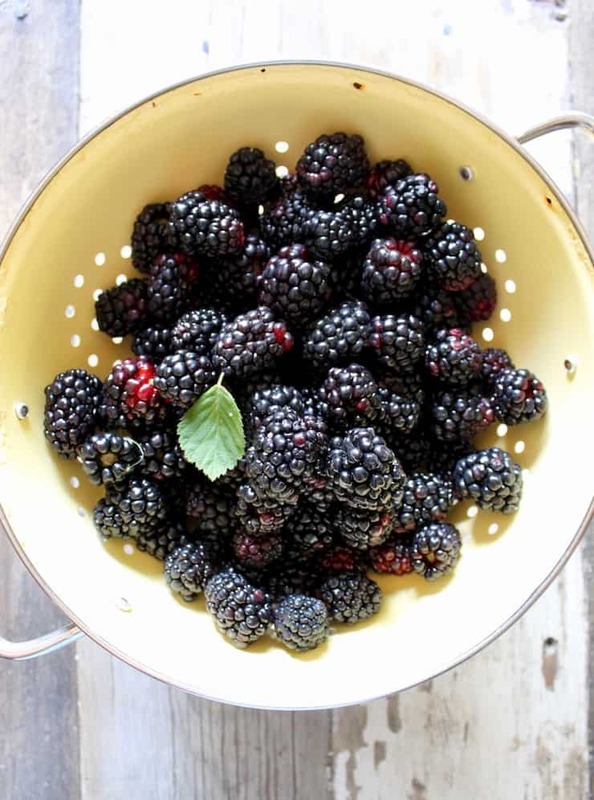 The blackberries were huge and plump, deep purple-black, and better than any I’ve ever had before. And the peaches, I can’t even. Beautiful, firm yet tender, sweet and one bite says it all, with peach juice running down my chin. The peaches were a breeze to pick, the blackberries ~ not so much. Those are some thorny bushes, razor sharp!! Next year, I’ll be wearing gloves and a long-sleeved shirt. People definitely either love or hate blackberries. I’ve had quite a few discussions with customers about them. A lot don’t like the seeds or think they’re sour. Others love them ~ to make jam, pies and even wine. 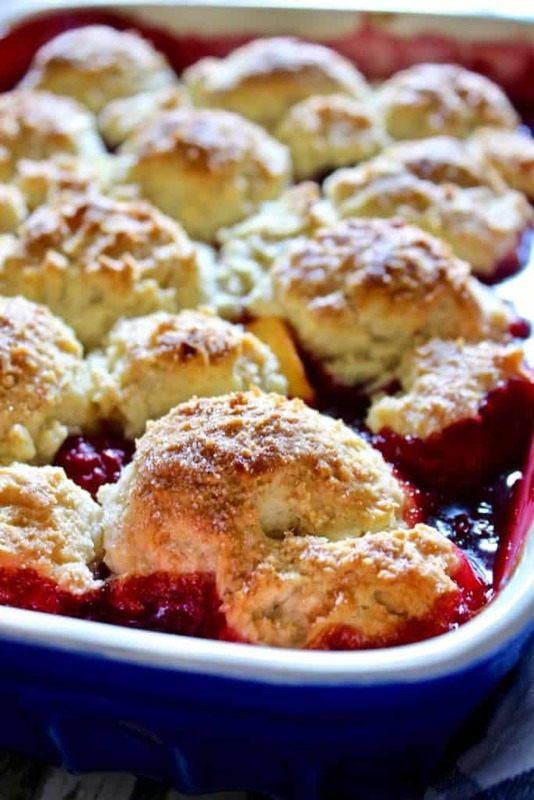 I think they’re perfect in a cobbler or crisp and pair wonderfully with peaches (so do blueberries). 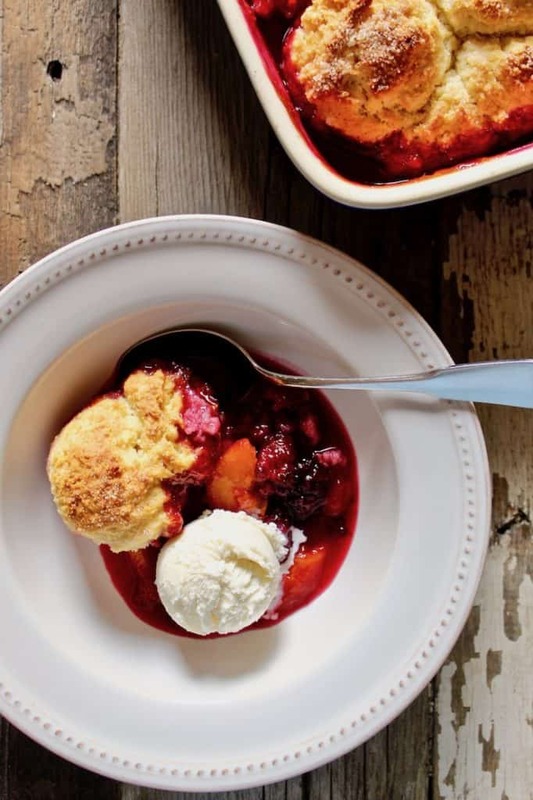 Now is the time for this Farmstand Blackberry Peach Cobbler. 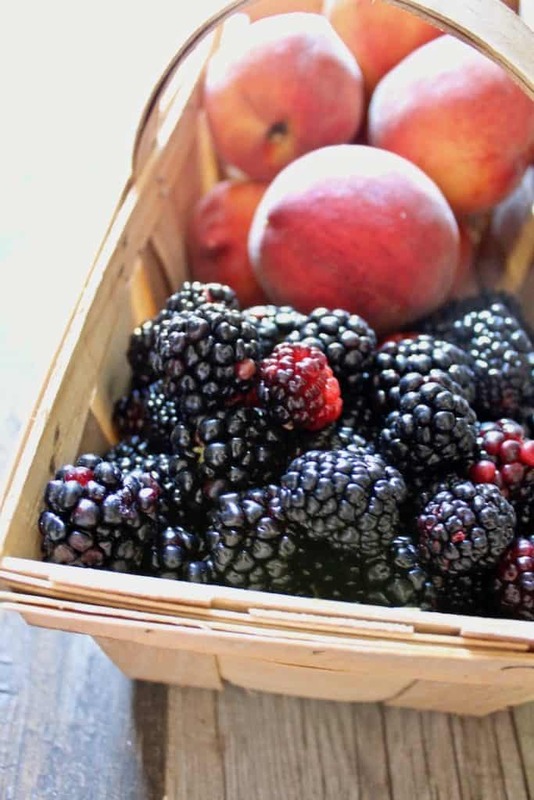 It’s warm, sweet and comforting with a buttery biscuit-like crust over juicy cooked down blackberries and peaches. All that’s needed is a scoop of vanilla ice cream ~ summertime. Next up, Fire Roasted Salsa with the red, ripe tomatoes from the farm. I love all the local, seasonal, homegrown stuff I can get my hands on! 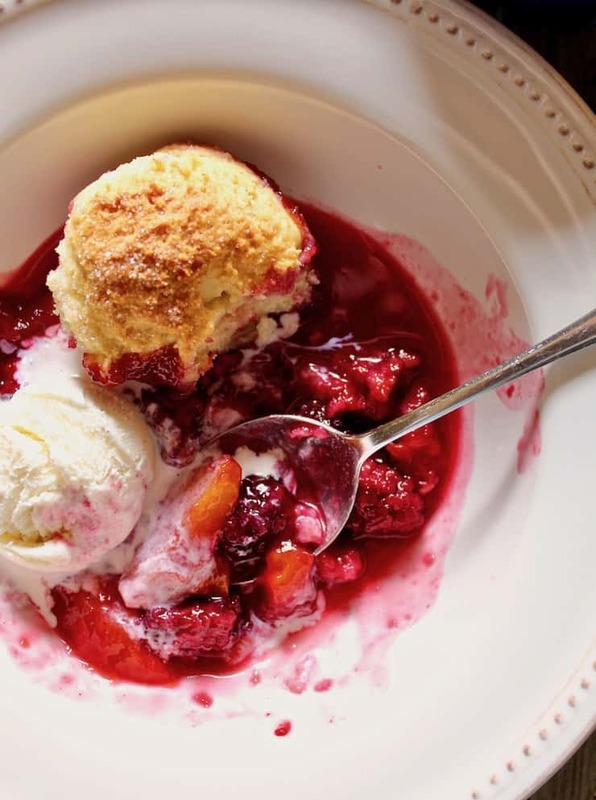 A summertime treat, fresh picked blackberries and peaches, together in a sweet fruit cobbler. Topped with a crisp, buttery biscuit-like crust and served warm with ice cream. Preheat oven to 425ºF. Butter a 9 X 13 inch glass or ceramic baking dish (3-quart capacity). In a large bowl, whisk together 1½ cups sugar and cornstarch, then add the blackberries and peaches and toss gently to combine. After starting to mix, add cinnamon, nutmeg and vanilla, continue to toss and combine well. Transfer to prepared baking dish and bake until just bubbling, about 10 - 15 minutes. Meanwhile, make the dough by whisking together the flour, baking powder and salt in another large bowl. Add the butter and blend with your fingertips or pastry cutter until mixture resembles coarse meal. Add milk and stir with wooden spoon just until a dough forms. Using a large ice cream scoop, drop dough onto hot fruit mixture in 12 mounds (about ⅓ cup each), any extra dough can be dropped evenly around the mounds. Sprinkle dough with remaining teaspoon of sugar. Bake cobbler in center of oven until top is golden, 25 - 35 minutes. Let cool on a wire rack for a bit, then serve warm with a scoop of vanilla ice cream.